Tired of dragging out a bulky food processor and guessing which attachment is the right one for the job? 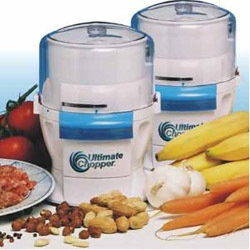 The compact Ultimate Chopper is 4 machines in 1 so you can replace your food processor, coffee grinder, standing mixer and ice cream maker and gain more counter space in your kitchen. The Ultimate Chopper is a European-designed food processor available for the first time in the US. 750 watts of power provides the power of machines costing five times as much to grate, chop, grind, puree, dice, and mince almost anything. With your help we can reach more people and let them know about Ultimate Chopper whether this product works or not. I was really loving the functionality of my chopper until the blade assembly disintergrated into pieces while using it one day. Good thing the bowl broke the propulsion of the blade and pieces or I might have been badly hurt. I do miss it.